In Washington, DC: Eugene Onegin — Opera or Not? Vocal distinction, good acting and gorgeous costumes marked the Washington National Opera’s production of Tchaikovsky’s Eugene Onegin, which returned to the Kennedy Center for the first time in some three decades. 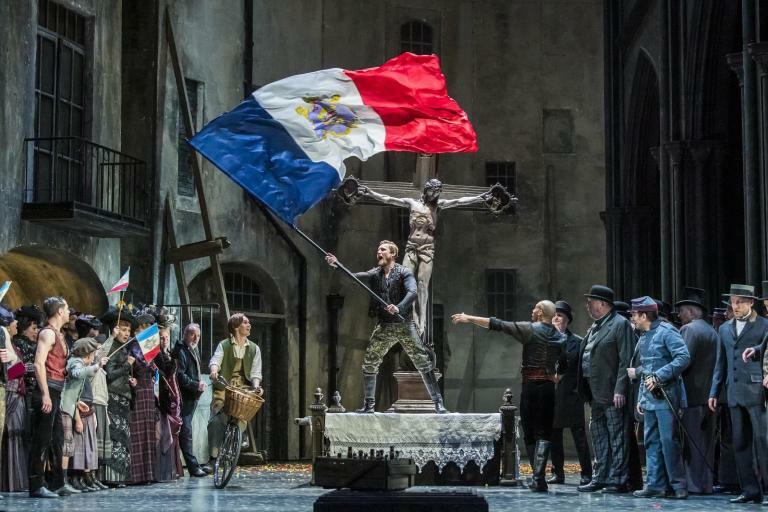 As a complete newcomer to this opera, which I caught on the third of its six performances, I hesitate to presume whether its shortcomings were attributable to the production, Pushkin, or Tchaikovsky. Apparently, the composer wished to escape operatic conventions by calling his work ‘lyrical scenes; instead. Perhaps this is because he detected in Pushkin’s poem, on which he based the eponymous Eugene Onegin, certain faults as a potential opera. As he wrote to his brother Modest, ‘I fully realize that it gives little scope for treatment, and will be poor in stage effect’. On the basis of this production, I would give Tchaikovsky a 50/50 split decision on that prediction — at least in the way in which WNO divided the three-act opera into two parts. The first half was as dramatically inert as the second was engaging. The easy explanation is that most of the overtly dramatic situations were packed into the latter. The story is one of unrequited passion, for which Tchaikovsky wrote music that is sodden with sadness. Country girl Tatiana loves worldly sophisticate Eugene, who doesn’t reciprocate. Young poet Lensky loves gorgeous airhead Olga, who may or may not reciprocate. Friends Lensky and Eugene quarrel over flirtatious Olga, resulting in a duel in which Lensky is killed. Eugene travels the world seeking diversion and solace, only to return several years later to find country girl Tatiana is now a princess, whom he finally realizes he loves. Too late for him, Tatiana spurns him to remain faithful to her much older husband, Prince Gremin. Since little of the action takes place in the first part of the evening, vocal characterization has to establish things. As the singing was of a uniformly high-to-excellent standard, a concert version might have been sufficiently satisfying — in fact, perhaps preferable — rather than an operatic treatment. Two problems presented themselves. One was that the orchestra frequently swamped not only the soloists but the chorus. The singers practically needed to be near the downstage edge to be heard distinctly. This problem was sufficiently severe that I began to suspect that the orchestra had been mic’ed and someone had turned the amplifier up too high. As it was, only several of the lead singers seemed able to pierce through the sonic veil. I should not exaggerate these problems. In any case, they all largely disappeared in the compelling second half, which brought home the larger lesson that passion is inappropriate as a guide to life. As Onegin, baritone Igor Golovatenko was outstanding in every respect, as was tenor Alexey Dolgov as Lensky. As Lensky’s fiancee Olga, mezzo-soprano Lindsay Ammann sang very well, and similarly, Victoria Livengood as the nanny Filippyevna. Tenor Joshua Blue did a nice turn as the French tutor Monsieur Triquet. As Tatiana’s older husband, Gremin, bass Eric Halfvarson practically stopped the show with the power of his voice and portrayal. Special kudos to costume designer Michael Levine and lighting designer Christine Binder. Eugene Onegin runs through Friday, March 29.